The downside to this awesome feature is that Microsoft never provided a great way for managing the libraries, but third-party developers stepped in to fill the gap. The same goes for Windows 8. 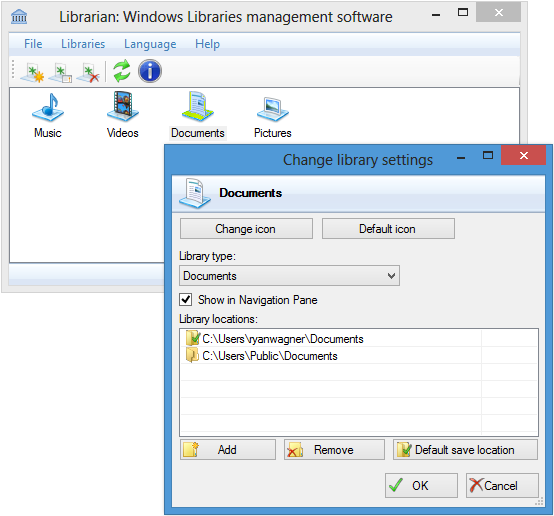 An app called Librarian supports creating, updating, and removing libraries on both Windows 7 and also on Windows 8. As you can see in the screenshot above this particular app gives you full control over how the libraries behave. One thing I really like is that it lets you choose the default location to save files, which I know is something I’ve had many people ask me about before. If you don’t use an app like this to change the default save location Windows will decide where it should put files when you do things like save files to the library. Now you’ll be able to choose where you want the files to go. If you’re looking for a way to simplify folder management on your computer this app may be the key to doing that.